1 cup water. The amount of water required depends on the quality of gram flour, so add as required to make a thick yet flowing batter. Grease a steamer pan with ¼ to ½ tsp oil. Take 1.5 cups besan in a mixing bowl or pan. Add 2 to 3 pinches of haldi powder, a generous pinch of hing, 1 tsp lime juice and 3 tspadrak-hari mirchi paste and salt. Add 1 cup water or as required to make thick yet flowing water. The amount of water required depends on the quality of flour, so add as required. Stir well. Add 1 tbs prava& stir to a smooth thick batter without any lumps.The batter should be thick yet flowing. Quick tip: If the batter becomes thin, then add 1 to 2 tbsp more rava or besan. Also bring to a boil 2 to 3 cups of water in a steamer pan or electric cooker or pressure cooker. The amount of water to be added depends on the size of the steamer or pressure cooker. Stir briskly and quickly. 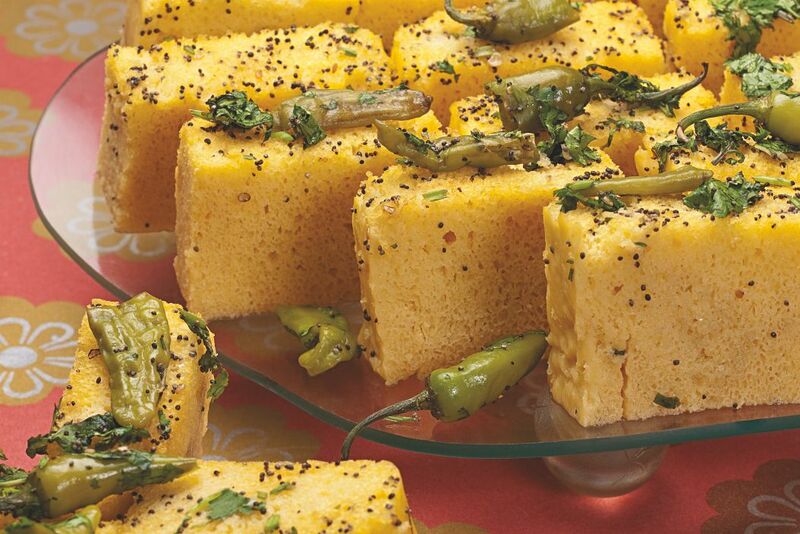 Mix well to give the dhokla a smooth texture. The batter would froth and become bubbly, so you have to be quick. Pour the batter in the greased pan. The dhokla batter is ready to be steamed. Place the pan in a steamer or pressure cooker. The water should already be boiling or hot when you place the pan with the dhokla batter. When using pressure cooker, remove the vent weight / whistle from the lid and cover the cooker tightly with its lid. Steam for 12 to 15 minutes on a medium to high flame. To check the doneness, insert a knife and if it comes out clean, the dhokla is done. If the batter sticks to the knife, then you need to steam for some more time. When the khaman become warm, with a butter knife gently slid along the edges. Keep a plate or tray on top of the pan. If greased well, the khaman will easily get inverted on the plate. Slice the khaman and keep aside. In a small pan, heat 2 tbsp oil. Add 1 tsp kali miri and allow them to crackle. When the kali miri are crackling, add 8 to 10 kadi patta and ½ to 1 tsp chopped green chilli (optional). Stir and then add 2 tsp sesame seeds & sauté till it changes colour. Add 1/3 cup water. Be careful while adding water as the mixture sizzles. Add 2 tsp sugar. Stir and allow the tempering mixture to come to a boil. Then pour this mixture evenly on the khaman dhokla. Garnish with 2 tbsp chopped dhaniya seeds and 2 tbsp grated coconut. Serve straight away or you can store them in an air tight box and refrigerate.